150 Redpath is going to be 38 storey building, where developers Freed and Capital Developments are piling on the amenities to cater to busy urbanites with an appetite for non-stop activity. Public areas will be spread out across two floors, and include a 24-hour diner to serve customers everywhere from its public patio to a private rooftop terrace. The amenity package is really built for a 24/7 lifestyle, no matter what time of day, there’s something to do for residents. There will be an on-site, 24-hour diner with room service, as well as service to the outdoor infinity pool and cabana area, which is pretty much hotel level service. This modern asymmetrical project – designed by architectsAlliance – will also offer a 24 hr concierge, dry cleaning and dog walking services, in addition to a fitness centre, steam and hot stone therapy rooms, party, dining and lounging areas. 150 Redpath will also have an amenity area called the Cave, which is a lounge that includes a games room, golf simulator, a bar equipped with a rail for taps for various local and international beer offerings, games tables and TVs for residents to watch their favourite sporting event. 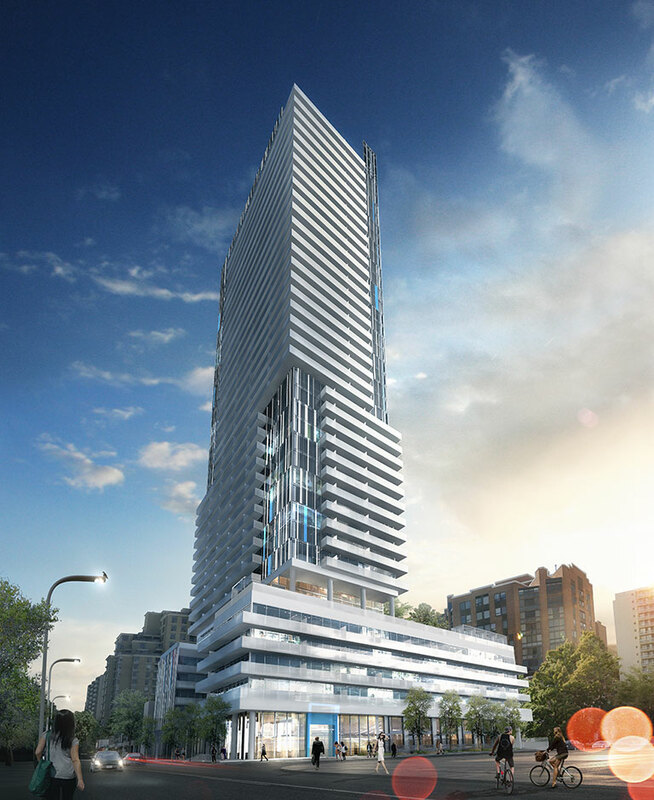 Local establishments will still be a major draw for the 543-unit high-rise, which will stand across from a shorter sister tower at 155 Redpath as the second instalment by the developer at the corner of Roehampton Avenue, just north of Eglinton Avenue. 150 Redpath is a short walk to so many amenities in the area, like cinemas and restaurants, just to name a few fabulous ones like Cibo Wine Bar, North 44, La Vecchia, The Keg, Zucca and Coquine. Essential for all ages are also in abundance, such as a new Loblaws and LCBO, Yonge subway line, TTC buses and the future Eglinton Crosstown LRT. Prices range from $221,990 to over $1-million.